On August 3, 1912, the balloon Boston, piloted by J. J. Van Valkenburg, president of the Aero Club of New England, ascended from Pittsfield, Massachusetts. Also aboard was William C. Hill, treasurer of the club. The balloon sailed northeastward towards Mt. Greylock, in the town of Adams. While over the mountain, it hit what was described in the press as an “air hole” and abruptly dropped 1,500 feet and smashed into the tops of some trees. It then inexplicably rose again, soaring to an altitude of 6,000 feet. It then continued on a northeasterly course until landing in Rowe, Massachusetts. Nether man was reported to be hurt. Research has found another balloon flight over Mt. Greylock that almost ended in disaster. On September 19, 1884, Mr. J. 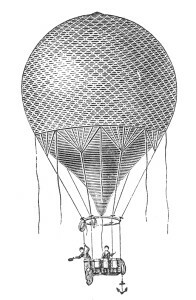 A. Rogers of Boston ascended in a balloon from North Adams, Massachusetts, to an altitude of 10,000 feet where he began to suffer from hypothermia. As the balloon passed over Mt. Greylock it began to fall at a rapid rate, and it was with great effort that Rogers was able to throw out enough ballast to prevent the craft from crashing into the rocky summit. With disaster averted, the balloon sailed off to the southwest and landed in Williamstown, Mass.